Putting Franklin-Christoph Music Nib And Zebra G Nib On Jinhao 450? I've been hearing a lot about the "Frankenpen" method of putting the Franklin-Christoph music nib onto a $5 Jinhao 450 pen body, so I bit. However, the feed and nib do not seem to align perfectly once seated in the Jinhao's section, and when I tried to put the cap on, I can tell that the nib is bumping up against the inside of the cap, and if I try to snap it closed, I'm sure it will damage the nib. I also tried putting a Zebra G nib (it doesn't come with a feed; it's apparently a dip nib) onto the Jinhao using the Jinhao's original feed, but that doesn't fit at all. You have to use a nib and feed that is sized right for your Jinhao pen. For the MS nib you need to get a file and file out the grip section a tiny bit. The X450's is a bit narrow that is why the nib is being rotated. Frankenpens are often modified. The G nib to the TWSBI pen was very modified. Re: the F-C music nib: I didn't realize that I was supposed to use the Jinhao's feed -- not the one that came with the F-C. Once I figured that out, it fit perfectly, and the nib is a dream! Very happy about that one! Re: the Zebra G nib: No luck with this one so far. I have two Jinhaos, and on one the nib didn't fit at all. On the second, the nib fits securely with the Jinhao feed in the section, but there's a gap between the nib and the feed, so even though the feed is full of ink, the nib stays dry and will not write at all. It looks like if I bend the curve of the nib slightly to be a bit flatter, it might fit better. I guess I just have to mess with it and see what happens? I've heard some people are putting the Zebra G on the Noodler Ahab, though not without futzing around. Is that a better fit than the Jinhao? Im a newbie but Ive done the exact thing you mention in your post. I know this topic is a year old but I was looking for more instructions on this and finally succeeded with some experimentation. Thought I'd pass on the info. It works but tends to jump on the 750 depending on how wet the ink is. I tried 2 different inks with very different results. 1. 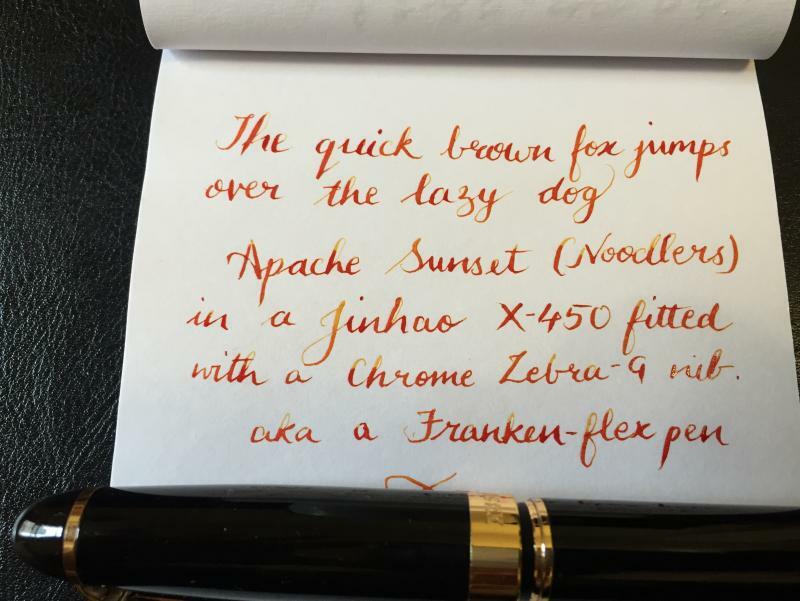 Noodlers Apache Sunset, which I think is a very watery(?) ink and so it tended to skip more if I did more upstrokes. 2. Higgins Waterproof Black, which is a very dense thick ink and worked beautifully for both up and downstrokes. 3. Also, I'm a newbie so perhaps my calligraphy technique isn't the best. I'll try to post pictures of the writing samples with both of these inks in the Jinhao 450. Edited by skalra, 03 February 2016 - 07:32. I know this topic is a year old but I was looking for more instructions on this and finally succeeded with some experimentation. Thought I'd pass on the info. . . . Thanks for posting your experiments, skalra. I gave up on my own Zebra G Frankenpen experiments a while ago, but I'm still interested in the concept. You might be a newbie, but it looks like you learned a lot from these experiments! By the way, my original post mentioned my Frankenpen of the F-C music nib and Jinhao. While the fit was fine and the combo wrote well, I found the Jinhao body to be too heavy for my hand. I eventually sprang for a F-C body, and it's so much nicer that I wish I'd gotten it to begin with. Since then, I've become less enamored with the whole concept of Frankenpenning using Jinhao bodies. They are cheap, but if I don't like the bodies, then even if they work, I won't be happy. If I can find a different body that works with the Zebra G, I'd be willing to put in the time to make it work. I'm happy to hear it is working out for you. I have used a Zebra G with many pens, including a Jinhao X450 and Jinhao X750. There are entire threads dedicated to the process. I have found that the X750 seems to work a bit better with this process, but those results are anecdotal at best. --There are many "G" style nibs, I have seen some folks try to use other types, Nikko G nibs especially, thinking that they are all the same. They are not. The only one that seems to have dimensions that work in place of #6 nibs are the Zebra G nibs. --The fit is not perfect, some jamming and experimentation is needed to get it right. It has never taken me more than 10 minutes of playing to get the setting correct. This is pretty much the case with most folks who have successfully paired the two, once you figure it out it is a pretty easy process. --The Jinhao feed is plastic, which means that it is not really able to be properly heat set (it can be done, but it will not work as well as it will with an ebonite feed). This results in a less than ideal ink flow. It will work pretty well, but it may result in some railroading when you flex too quickly or too broadly. There are some tricks to improving the ink flow, but you have to realize that even though the Jinhao feeds are wet feeds, they are not designed for flex...a little patience is required. --Youtube videos and pictures showing the exact process are helpful in getting it right, but experience is the best teacher. --The Zebra G is a dip pen nib, it is meant to be disposable. It will last for a few months of regular use (give or take) before it will have to be replaced due to corrosion and/or metal fatigue. It is not meant to be used as a permanent nib, so keep that in mind. In the end the Jinhao X450, X750, and 159 can work very well with a Zebra G nib, but they were not created to go together, so you do have to understand this fact going into the process and temper your expectations accordingly. Edited by jabberwock11, 03 February 2016 - 21:11. I love flex nibs, but can't get used to the whole 'dip, clean, write, pause, dip.. Repeat' process. This was by far the easiest, not to mention inexpensive option for me. Attaching a sample image of writing. 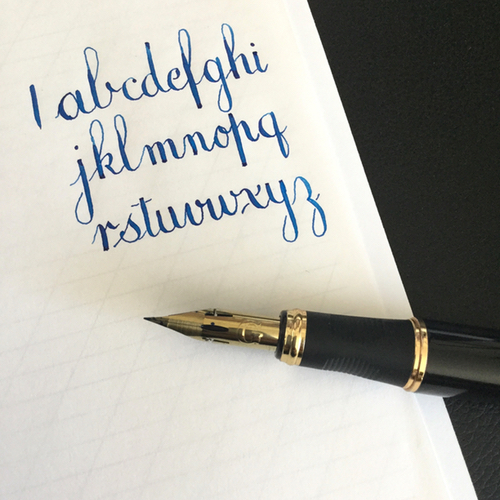 Nice writing -- and great ink for that kind of writing! Thanks for showing us. I installed a Zebra G nib in my Jinhao X450 a couple of days ago. I like the fact that I did not have to modify either the nib or feed to make it work. It did not look like the nib would fit in the section at first, but after fiddling with it for a few minutes, I was able to jam it in there (I checked and it can be removed too for replacing the nib later). I have installed #6 nibs in the X450 with no trouble before (I was using a 1.1mm Goulet nib in that pen for a while).